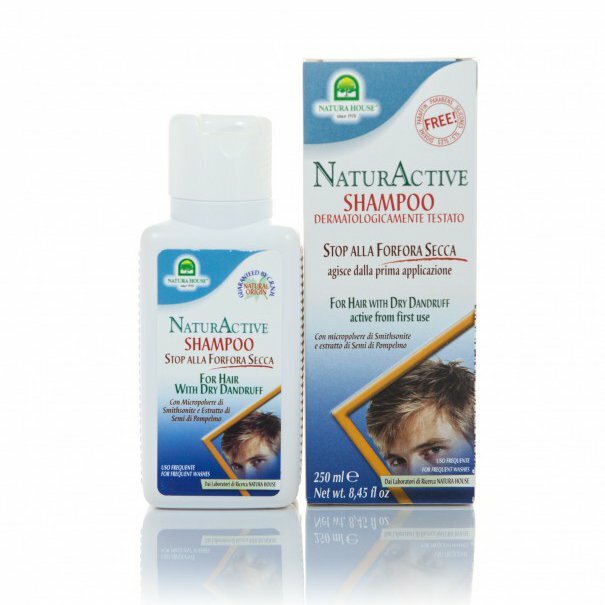 NaturActive Shampoo for Hair with Dry Dandruff is produced by the Italian cosmetic brand Natura House. The product is designed for frequent use and produces a noticeable effect from the first application. This is a perfect remedy for dry dandruff. The shampoo eliminates the cause of this type of dandruff due to the pronounced antiseptic effect of smithsonite (zinc carbonate) powder enhanced by natural extracts and essential oils. The shampoo contains 98.5% natural ingredients. Its key active ingredients are grape seed extract, eucalyptus essential oil, thyme oil and the Piroctone olamine anti-dandruff complex. These ingredients have pronounced antimicrobial and anti-fungal properties. They moisturise the scalp and soothe it. Due to its mild detergent base, the shampoo gently and delicately cleanses your hair and scalp of dirt and grime. It also prevents dandruff from re-emerging. Free of SLS/SLES, parabens, silicones, waxes, PEG/PPG, PANI, acrylic polymers, amine, mineral oils. Directions. Apply a small amount of shampoo onto wet hair. Lather, leave for 1 minute, rinse with clean, warm water. Ingredients. Aqua (Water), TEA-Lauryl Sulfate, Sorbitol, Glycerin, Cocamidopropyl Betaine, Laureth-2, Hydrolized Wheat Protein, Smithsonite Extract, Citrus Grandis Seed Extract (Grapefruit Extract), Eucalyptus Globulus Oil (Eucalyptus Oil), Thymus Vulgaris Oil (Thyme Oil), Polyquaternium 7, Guar Hydroxypropyltrimonium Chloride, Glyceryl Oleate, Laureth-3, Lauryl Glucoside, Piroctone Olamine, Parfum (Flavor), Maris Sal, Methylchloroisothiazolinone, Methylisothiazolinone, Imidazolidinyl Urea, Limonene, Citronellol, Coumarin, Eugenol, Geraniol, Linalool. Want to buy NaturActive Shampoo for Hair with Dry Dandruff? Call us or submit your order via our web site! Natura House is a cosmetic brand owned by the Italian company of the same name. The company is based in the municipality of Orbassano, located about 15 kilometres south-west of Turin. Its history began in 1970, when Mr and Mrs Spialtini took over an Italian-Swiss cosmetic company. Originally, the company became BIOKOSMA’S products licensee in Italy both for marketing and production. In 1973, it launched an alternative foods line. The company began to manufacture beauty and health aids, natural cosmetics formulated with medicinal herbs and phytotherapy products designed for people looking for alternative treatments. In 1979, Biokosma Italy was replaced with Natura Holding srl. The company concentrated on developing and producing natural cosmetics, health aids and foods. The Natura House brand was officially registered in 1988. Today its products are popular both in Italy and abroad (especially in Spain, Germany and Greece). They are exported to over 60 countries on all continents. All Natura House products are formulated with pure natural ingredients derived from medicinal herbs native to the Mediterranean region. Each product contains up to 99% ingredients of natural origin and has a safe formula. Natura House does not test its products on animals. Natura House's cosmetics are dermatologically tested with the cooperation of Pavia University.